Often overshadowed by nearby dazzling Manhattan, the former industrial city of Newark has in recent years undertaken renovations to revitalize its travel appeal and tourist attractions. Today, visitors to Newark will discover remarkable attractions, exciting sports arenas and a lively arts and culture scene. Newark’s shining star attraction is the Branch Brook Park. 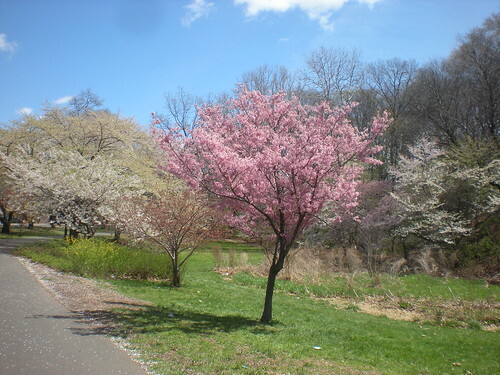 Boasting America’s largest collection of cherry blossom trees, this 360-acre park offers an oasis from the hustle and bustle of the city. You can stroll along scenic paths, charming bridges and trails that wind around ponds and lakes. Or, if you prefer, you can choose among a number of recreational activities that include cycling, baseball, tennis, softball and roller skating. One of the most magnificent structures in Newark is the Cathedral Basilica of the Sacred Heart, known for its French Gothic architecture, giant bells, 200 stained glass windows and an impressive pipe organ. In addition to tours, the cathedral also hosts concerts throughout the year. A visit to Newark offers you the unique experience of touring the Thomas Edison National Historic Park, a complex that houses the laboratory and residence of Thomas Edison. A tour here allows you to view films about Edison’s inventions, explore the labs, beautiful gardens and the 29 rooms of the Victorian mansion. Another significant park located downtown is the historic Military Park, which features noted sculptures and monuments like the massive Wars of America and the bust of John F. Kennedy. On Thursdays, the park is the scene of a farmer’s market where you can find a bargain on fresh produce, baked goods, candy and crafts. One of the best places in Newark to feast your love of arts and culture is the Newark Museum. Here, you can spend most of the day browsing among more than 80 art galleries and a sculpture garden. Additionally, this fabulous complex also houses a mini zoo, science exhibits, a planetarium and historic houses. Located nearby hotel accommodation, the New Jersey Performing Arts Center is an excellent establishment presenting live productions of theater, dance and music throughout the year. What’s more, Newark hosts several festivals every year celebrating history, arts and culture. These events include the Brazilian Festival in September, the Cherry Blossom Festival in April and the Geraldine Dodge Poetry Festival in October. Both the Lincoln Park Music Festival and the Portugal Day Festival are held during July. Newark is a vibrant sports city with several venues where you can watch live games such as the Prudential Center, which is home to the professional ice hockey team, the New Jersey Devils, as well as basketball and soccer teams. At the Riverfront Stadium, you can see the Newark Bears baseball team hit a home run. Just 15 minutes away by train is the Meadowlands Sports Complex, where you can watch the New York Giants play football or the New York Jets play basketball. Newark’s climate features hot and humid summers while winters tend to be cold and damp with some snowfall. Spring and fall usually offer mild weather and beautiful foliage. Ready to see the new Newark? You can begin your trip today by checking out the great deals that are online now.